In this week’s in-production column, indieWIRE puts the spotlight on a nearly complete film by Jay Duplass. From Kickstarter: The new project from “Small Town Gay Bar” director Malcolm Ingram, which tells the story of the bathhouse-club that gave Bette Middler and Barry Manilow their start; an original epic fantasy; the new project from Sundance alum Rodney Evans (“Brother to Brother”); and a photo project from the filmmakers of “Battle for Brooklyn,” which heads to Hot Docs this week. When the Duplass brothers (“The Puffy Chair,” “Cyrus”) were invited to bring their film “Baghead” to the Grenada Film Festival in Spain, Jay Duplass didn’t bring his brother and collaborator Mark with him. Instead he brought Kevin Gant, a guitarist he had recently decided to profile in a film who was eager to immerse himself in the world of the flamenco guitar in its natural habitat. In the middle of shooting studio films in Los Angeles, Jay decided that he needed to reconnect to something from his younger days, something to ground him. To fulfill this desire, he made an effort to track down the elusive singer. Through his network of Austin friends, Jay was able to reconnect with Gant, and from there, Jay documented the musician’s life as he rediscovered the guitar. In the time since Jay last saw him, Gant had begun to devote himself to his job at UPS; both of his parents had died, and he was an only child. The interest in his music was welcome to Gant. Now that the film is “complete” (The film had a screening in SXSW, despite a lack of color correction and complete sound mix), Jay is taking the film on a festival tour with Gant in tow for a concert/Q&A hybrid that will follow each screening. Jay has developed a Kickstarter campaign to put the finishing touches on the film and to pay for the expenses of taking Gant and “Kevin” on a film festival tour to promote the film and Gant’s music. To contribute or find out more, visit the Kickstarter page here. Current status: The team hopes to begin shooting in June. For more information and to support the film: Kickstarter page. As with all Kickstarter projects, the filmmakers will only receive donated funds if they reach their target goal of $20,000 by the end of the campaign (May 11). Current status: The team is hoping to shoot later this year, after producing a teaser video and garnering interest from investors and audiences. For more information and to support the film: Kickstarter page. As with all Kickstarter projects, the filmmakers will only receive donated funds if they reach their target goal of $10,000 by the end of the campaign (May 19). Logline: “The Happy Sad” is a feature-length narrative film that follows two couples, one black and one white, whose lives collide as they navigate open relationships and sexual identity. About the film: “I became friends with the screenwriter Ken Urban when we both had residencies at the Macdowell Colony in the summer of 2008. We both sensed a connection in the work that we were doing and stayed in touch in the subsequent months. I went to a performance of the stage version of ‘The Happy Sad’ at the Summer Plays Festival at the Public Theater in New York in 2009 and was extremely moved by it. I immediately saw its potential as a film and when I mentioned that to Ken he told me he had already begun adapting it into to a screenplay. Current status: The screenwriter has completed several drafts of the screenplay, and after a few more edits, the team intends to start shooting July 2011. For more information and to support the film: Kickstarter page. As with all Kickstarter projects, the filmmakers will only receive donated funds if they reach their target goal of $15,000 by the end of the campaign (May 12). Logline: In 1989, following in the footsteps of Robert Frank, Garry Winogrand, and William Eggleston, I drove across the country and documented malls across America. I had a cheap Nikon FG-20 and an even cheaper lens – but I had a lot of passion. 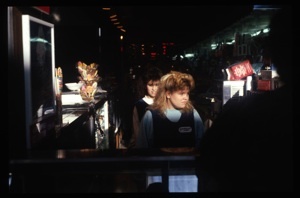 About the film: “In the winter of 1989 I started a photo project in Smith Haven mall in Long Island. At the time I was a religious studies major. In addition to learning about whirling dervishes and African tribes, I also took a photo class per year- and that winter i was taking a color class. My girlfriend at the time went to Stonybrook on Long Island, and we had to go the mall on an errand. It was packed and electric with energy and I knew right away I’d found the subject for my class. I was a big fan of Robert Frank, and I thought that if he was going to shoot “The Americans” today he’d be spending a lot of time in malls. With my academic focus on sociology and religion I was very interested in how people interacted, and there was a whole lot of interacting going on in that mall. For more information and to support the film: Kickstarter page. As with all Kickstarter projects, the filmmakers will only receive donated funds if they reach their target goal of $12,000 by the end of the campaign (June 30).